Matheny’s Arts Access Program has been awarded a Kessler Foundation Community Employment Grant of $100,000 to launch a unique vocational art project. Arts Access will partner with Arts Unbound, bringing together these two leaders in the realm of arts and disability to form Art Garden CSA. This CSA (community-supported art) project aims to connect artists with disabilities with art buyers in a way that has never before been attempted with this population. Ten artists will be selected and commissioned to create original artwork that is unique to the Art Garden CSA. These works will then be distributed at three live pickup events around the state to anyone who buys one of the 25 available “shares”. At these pickup events, the shareholders will have the opportunity to meet the selected artists and see what awaits them in their box of limited edition art. The artists will work with the Art Garden team to learn and participate in important vocational practices such as blogging, thank you letters, self-promotion, relationship building, and many other entrepreneurial activities that are key to becoming a professional artist. A recent Kessler-led national study revealed that 68% of people with disabilities are striving to find work. Through its Community Employment Grant Program, Kessler Foundation funds non-traditional solutions that increase employment outcomes for citizens with disabilities. The arts fill this role by allowing individuals with disabilities to be self-employed and work on their own schedules. The Kessler Foundation is a public charity dedicated to improving the lives of people with disabilities. 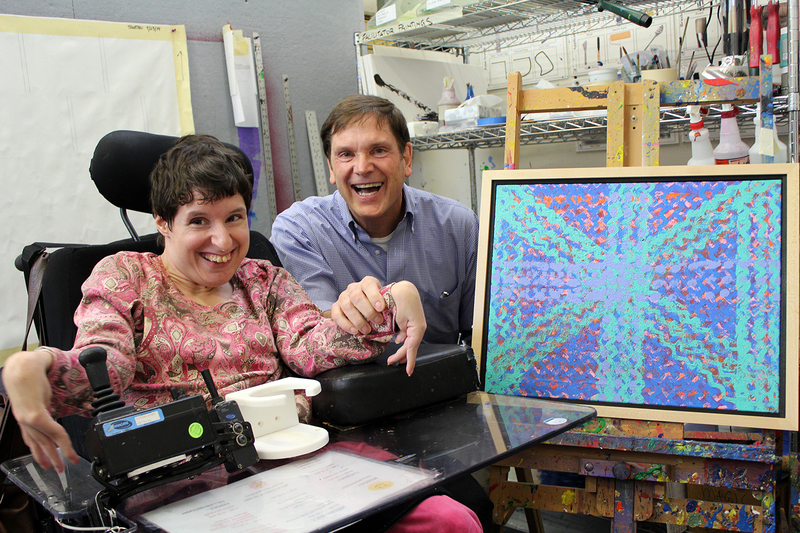 Arts Access artist Jessica Evans with Peapack-Gladstone businessman Tim Peters, who purchased her painting. Arts Access is a unique fine arts program where individuals with disabilities can fully express themselves in the creative arts. 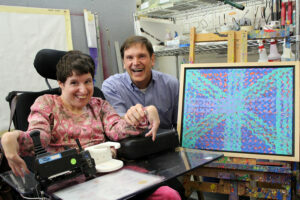 Arts Unbound is a studio and gallery in West Orange, NJ, dedicated to the creative expression of persons with disabilities. Both organizations have been at the forefront of offering professional development opportunities for artists with disabilities through licensing and original artwork sales. The Art Garden CSA will launch early next year, and shares will be available for purchase in November 2015.